One of the most famously classy places in Chicago was once Peacock Alley, a marble-lined tunnel that went under Congress Street, connecting The Congress Hotel to the Auditorium Theatre. Like most of the classier parts of the Congress, it’s now a memory, long since bricked-off. But a recent expedition has uncovered its original entrance. 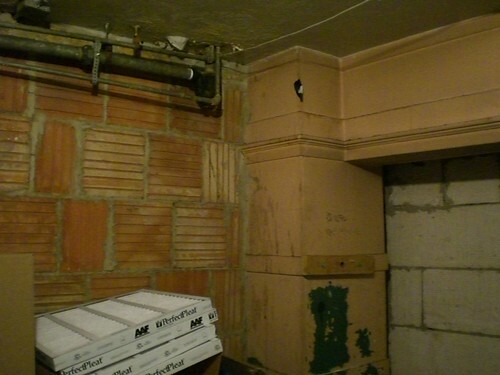 That this was the tunnel is evidence by the fact that the trim on the wall extends IN to the bricked off area. It’s well sealed by the brick slats on the right. I wonder what the entrance on the Auditorium side looks like today! BTW – YOUR NEIGHBORHOOD GIVES ME THE CREEPS officially hits stores today! It’s been on shelves for a week or so, but today is the official release.